The present work, which was until recently thought to be a portrait of Thomas Cromwell, is in fact an early sixteenth-century portrait of the influential courtier and jouster George Neville, after the original drawing by Hans Holbein of c.1532-5. The identity of Neville as the sitter for the Holbein drawing has only recently been established, following the discovery of an identifying inscription on the reverse of a miniature of the same sitter. 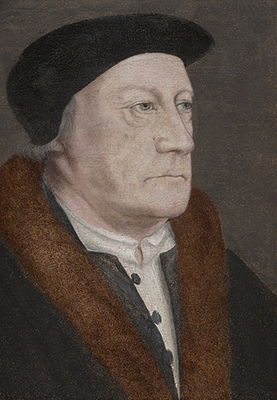 Until this point, due to a later inscription in the bottom corner of the Holbein drawing, the sitter of this portrait-type was thought to be Thomas Cromwell. Neville was the eldest son of George Neville, 2nd Baron Bergavenny (1436-92) and Margaret Fenne (d.1485) and as a kinsman of the House of Neville – one of the most influential families of the period, Neville’s career at court was assured. In 1483, at the age of just sixteen and following the marriage of Anne Neville to Richard III, Neville was knighted and in 1492 he succeeded to his father’s baronetcy. In 1497, at the Battle of Blackheath, Bergavenny demonstrated his military prowess to Henry VII and later the same year he entered the House of Lords. Although well received at court, in 1506 Bergavenny was accused to retaining 470 followers, a practice forbidden under the Statute of Liveries and suffered a hefty fine with a number of prohibitive sanctions, although when Henry VIII became king in 1509 these offences were brushed aside and in 1512 he was granted the Lordship of Abergavenny. In 1513 Abergavenny was elected to the chivalric Order of the Garter and in 1520 attended the lavish festivities at The Field of the Cloth of Gold, although by this point he had retired from jousting so would not have competed in any of the grand tournaments. Two years later he was made a Privy Councillor but in 1521 was implicated following the treason of his father-in-law Edward Stafford, 3rd Duke of Buckingham. After one year spent in the Tower, Abergavenny admitted to knowing and concealing Buckingham’s treason, and although he received a royal pardon, lost his various offices and was forced to sell his house at Birling to the king. By the late 1520s Abergavenny had regained the king’s trust and is noted as one of the petitioners to Pope Clement VII requesting the annulment of his marriage to Catherine of Aragon.